NASA's design for Project Orion. This version of the nuclear spacecraft is a slim 6,000 tons, as opposed to the 10,000-to-multimillion-ton variants previously suggested for direct (atomic) launch. Intended for a "clean" launch on a Saturn V booster, this Orion would still be capable of performing much better than chemical rockets, perhaps enabling it to pull off a round-trip, crewed mission to Saturn in 14 months. The following is an excerpt from the book "Amazing Stories of the Space Age: True Tales of Nazis in Orbit, Soldiers on the Moon, Orphaned Martian Robots, and Other Fascinating Accounts from the Annals of Spaceflight" (Prometheus, 2017) by Rod Pyle, now available in paperback and for Kindle. In the book, Pyle describes some of the most unusual and bizarre space missions ever devised by humans. Even avid space fans might be surprised by some of the stories Pyle has dug up. It could have been just like the movies. Specifically, the soppy sci-fi melodramas of the 1950s, those humorless, grim-faced sagas of men (always white Americans), square-jawed and broad of shoulder, who faced that Great Unknown, outer space (cue the reverb) with stoicism and Yankee guts. The troupe of six to twelve individuals were usually clad in faded blue jumpsuits (probably because they were all of military bent, possibly US Air Force)—no space suits or helmets for these guys; worrying about decompression is for sissies. These were steely-eyed, anvil-chinned rocket men. The heroes would walk up a ramp or climb a ladder into the great, gleaming, cigar-shaped silver rocketship (a long-lost term widely used in the early 1950s) without assistance or fanfare—in that sunny postwar era, it took only a handful of servicemen and a few elderly scientists to launch a manned rocket. Once inside, the crewmen would close a submarine-style hatch, strap themselves into great steel chairs, take one last look around their girder-festooned, capacious cabin (1950s rocketship flight decks were the size of your average New York bachelor pad and built like battleships), nod silently to the eldest of the bunch (usually wearing colonel's eagles), who would then push the button. This was inevitably a large red push button, marked in true military parlance with something like "IGNITE ROCKETS" or more simply "FIRE!" and off they would go into the Wild Blue Yonder, while on the ground (in a similarly military posture, perhaps within a Quonset hut in New Mexico), a few worried guys in white lab coats watched a twelve-inch radar screen with a huge white dot ascending. A handful of servicemen usually stood nearby, looking vacuously at meaningless blinking lights dancing on their consoles. A single computer, the size of a small RV, would click and whir nearby. This was Space Command (or some other imagined, militarized NASA precursor) after all. To be fair to the pioneering producers of these epic motion picture dramas, little was known of spaceflight before the 1960s, and sci-fi movie budgets were puny. Few movie studios took the genre seriously, and it's amazing that these innovative moviemakers pulled off what they did, given the general lack of respect these drive-in, Saturday matinee potboilers gained for them.2 But as we now know, the dramatic scenario outlined above is not exactly how human spaceflight turned out. The Apollo lunar landing program, initiated shortly after these types of films were made, mandated a different approach. NASA's moon rocket, Wernher von Braun's masterpiece, would be a multistage affair, operating right at the edge of its weight-lifting capability. NASA's first plan was to ascend directly to the moon, land, then, after a suitable period of exploration, return to Earth, shedding stages at appropriate junctures. But this brute-force methodology would have required a truly massive rocket (it was to be called Nova, and was much larger than its successor, the Saturn V), well beyond the means at hand. A bit more planning and a lot of innovative thinking resulted in the moon program we all remember, with the still-massive 363-foot Saturn V rocket propelling a tiny capsule and lander to the moon, of which only the thirteen-foot-wide capsule returned. It took hundreds of thousands of people to build it, thousands to launch and operate it, and somewhere north of twenty billion 1960s dollars to finance it. Apollo was a far cry from the rocketships of the movies. But there were alternative plans for a massive, battleship-sized single-stage spacecraft that could have flown to the moon and beyond. In its ultimate form, this behemoth would have dwarfed the motion picture versions. A hundred or more crewmen, leaning back in space-age versions of Barcaloungers, would have departed Earth with enough fuel, life support, and supplies to reach the moon, Mars, or even Jupiter and Saturn within months. Once in space the crew would have unbelted themselves and had far more room to drift, eat, work, and sleep than the International Space Station and even most modern submarines offer. It would have been like a well-appointed office complex in space, a true space liner—this majestic craft could have unlocked the entire solar system to exploration within the decade. And best of all? It was atomic. The cover of the "condensed" version of the many Project Orion studies. Classified for many years, it was released to the public long after the project was terminated. Yes, that's right. Rather than fiddling around with rapidly expanding heated gasses with a nuclear reactor, Ulam took the most direct path to high energy release: nuclear explosions. Ulam had been mulling this over for more than a decade, reasoning that chemical rockets were terribly constrained by both the mass of the fuels and the temperatures at which they could realistically operate. 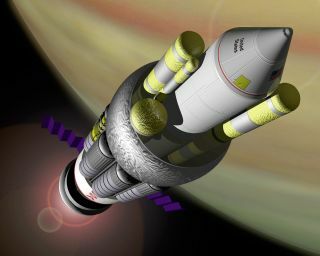 Other proposals to detonate tiny nukes inside combustion chambers (one proposal suggested a chamber diameter of 130 feet, or almost four times the diameter of the Saturn V), while an improvement over chemical rockets, were deemed impractical, and did not offer a large enough increase in performance to impress Ulam. But what if the combustion chamber could be eliminated altogether and a small nuke simply detonated in open space? A percentage of the energy released by a reasonably sized nuclear explosion—not specified in the paper, but probably on the order of a half to one kiloton (about 10 percent that of the Hiroshima bomb)—would nudge a nearby spacecraft with propulsive force that, while brief, would be enormous. Ulam characterized the spacecraft as an unmanned thirty-three-foot diameter, disk-shaped ship, with a mass of twelve to twenty tons. It would experience an acceleration of up to 10,000 g (the Apollo astronauts, riding atop the Saturn V, maxed out at just under 5 g, though the rocket was capable of more)—hence the unmanned nature of the design. Human occupants would have been turned into puddles of red jelly within moments. This robotic probe would carry dozens to hundreds of bombs, to be released at roughly one-second intervals (accompanied by a disk of plastic or container of water that would vaporize when the nuke ignited, to enhance the effect), and the resulting force of these continual explosions would propel the craft forward—right now. Ulam was concerned about the heat impinging on the base of the craft, and suggested that a magnetic field might help to shield the spacecraft from the high-energy, one-millisecond flashes. This was about as far as he got—it was a short study, but an intriguing one, and did not go unnoticed. In 1955 a new company called General Atomics was founded. It was a subdivision of General Dynamics, a huge defense contractor and builder of military submarines. General Atomics would specialize in efforts to harness the recently liberated power of the atom—in effect, their mission would be to find profit in nondestructive uses of atomic fission. The company became involved in a number of ventures, including a commercial nuclear reactor power generator, which was widely deployed. They also became interested in Ulam's classified paper (to which the chiefs of the company were apparently privy), and decided to pursue a serious study of the completely theoretical ideas within. Thus was born Project Orion, the nuclear pulse spaceship. While there were a number of variations on Orion's design, the propulsion system remained the same. At top is the "magazine" for holding the atomic bombs, from hundreds to thousands of them, depending on the version. The tubes extending downward are shock absorbers that aim to mitigate the massive concussive force to the pressure plate, at bottom, that's caused by the repeated nuclear explosions. The center tube, leading to a hole through the pressure plate, feeds the bombs to the rear of the spacecraft for detonation. Theodore Taylor, who held a PhD in physics from the University of California at Berkeley, had spent eight years at the Los Alamos National Laboratory and was a recent arrival to General Atomics. He was put in charge of Orion, and was partnered with a young Freeman Dyson, who held a PhD from Cornell. Between them, they made a thorough study of the propulsion concept, with variants ultimately ranging from a "small" 10,000-ton craft to an interstellar-capable version that would have been an unimaginably massive eight-million-ton hulk.5 While this seems to be a huge and possibly unrealistic range (a bit like building a Death Star that can fly into space from the Earth's surface), it does go to show the flexibility of the propulsive concept. Nuclear pulse propulsion scales nicely, if you have the engineering and technology to back up your ideas. This project became increasingly expensive, driving General Atomics to approach the Advanced Research Projects Agency, or ARPA (DARPA's predecessor) for additional funding. ARPA responded with a study budget of $1,000,000 per year to underwrite the project.7 It doesn't seem like a lot today, but Project Orion was being fueled primarily by brainpower at this point, and with the average annual salary in the US in 1958 being about $3,700.00,8 a million dollars went a long way toward salaries and talent retention. Taylor and his crew refined and improved Ulam's designs. The bomb sizes were determined for various versions of the spacecraft, and additional reaction mass, now defined as either plastic or wax, would probably be bonded to the bombs. The resulting craft looked either like a giant beehive or perhaps like a huge .50-caliber bullet standing on a milk stool. Perhaps the most important change to Ulam's design, however, was that the General Atomics version would be manned. The top half contained crew quarters and supplies storage; the bottom half was fuel (bomb) storage and a shock-absorbing system—really big, heavy-duty shock absorbers—capable of converting the 10,000 g, crushing propulsive blasts into survivable acceleration by absorbing and gradually releasing all that energy. At the base was the "pusher plate," the wide, flat disk that would absorb and transmit part of the energy from the bomb blasts. The bombs were to be sent from the storage magazines through a tube that penetrated the pusher plate, to detonate beyond—close enough for the blast to be effective, but far enough that the short-duration pulse would not melt the plate, a distance of about 100–200 feet. The bombs were uprated to twenty kilotons, in the same general range as the Hiroshima bomb, and would detonate about every ten seconds. The manned version of the spacecraft being studied in the late 1950s was to be about 150 feet high and 135 feet in diameter at the base (the pusher plate). Mass at liftoff would have been 10,000 tons (The Saturn V was about 3,100 tons). But rather than burning most of its mass (as fuel) to get into space, as the Saturn V did (and any chemical rocket does), most of Orion's mass would actually end up in space—a huge, and very helpful, difference. With a capacity of 2,000 bombs in this design, Orion's reach would be vast. As Dyson, ever eloquent, put it, "Mars by 1965, Saturn by 1970." This was all being planned at about the same time America was struggling to get a single man into space for three orbits, jammed in a tiny Mercury capsule, set atop a chemically fueled Atlas rocket (kerosene and liquid oxygen). Orion, in stark and awesome contrast, would carry a crew of 150 men, with thousands of tons (not pounds, tons) of supplies. They could go just about anywhere they wanted, assuming that life support and other issues could be worked out. No wonder the General Atomics researchers felt that von Braun was on the wrong track—Chemical rockets would never open up the solar system for spaceflight the way atomic pulse spacecraft like Orion could. Orion would require a continuing stream of nuclear explosions to accelerate. The frequency of detonations varied depending on the version being studied (its mass and intended purposes) and the phase of its flight. Once in space, the explosions could be spaced farther apart depending on the desired acceleration. Also, the bomb yield varied according to the flight phase—they could carry a variety of bomb sizes for different needs. For example, for liftoff they would have to detonate smaller bombs more frequently—at least one 0.1 kiloton bomb per second. And yes, they were going to do exactly what you are probably thinking—they would launch their atomic monster from Earth. Bang, bang, bang. Sorry, you have cancer—we're on our way to Saturn. This presented a thorny problem. To avoid the wrath of angry citizens and (later) the Environmental Protection Agency (EPA), the designers would either have to reduce Orion's mass to allow it to be lofted by a single launch of a Saturn V (which was later adopted into a revised Orion plan), or launch it in bits and pieces on multiple Saturn Vs and assemble it in orbit, or just go ahead and launch it under its own power with the nuclear bombs if the government could be persuaded to agree. Dyson calculated that each launch, statistically speaking, could result in between one and ten deaths due to cancer induced by fallout.10 Of course, compared to car accidents, cigarettes, or heart attacks, that number is small. But car crashes, cancer, and heart attacks are accidental—launching a giant atomic rocket that spews radioactive waste into the atmosphere is deliberate. It was bound to run afoul of popular opinion. This later configuration of the Orion design is downsized for launch on conventional large rocket boosters such as the Saturn V, removing the risk of radioactive contamination by the use of atomic bombs to achieve Earth orbit. In 1959, ARPA decided that it was done with Project Orion. NASA had taken over manned spaceflight projects (with the exceptions of some stillborn US Air Force efforts) and was, at the time, not interested in nuclear pulse propulsion—their rockets used explosive chemical reactions to go into space. They did use nuclear materials to power lunar experiments on Apollo, and some of their robotic planetary missions, but in small and nonfissionable quantities. So Taylor and General Atomics approached the US Air Force. Their timing was excellent, because it coincided with the air force's efforts to take a piece of the space pie for itself. They wanted to launch their X-20 spaceplane into orbit, or maybe beat NASA to the moon, or perhaps build a moon base, or ... well, you will know that story by the end of the book. The air force had a wide-ranging agenda that never amounted to much in terms of successful manned spaceflight.11 And, to put it kindly, they viewed nuclear explosives in a somewhat different light as did Taylor and his cadre—which is to say that nukes were useful for the annihilation of Moscow, but harder to envision as a propulsion source. Nevertheless, they eventually agreed to provide funds for the project with the hope that it might eventually have a military application. The Orion adherents began to study a design for the spacecraft that might be able to integrate with NASA's Saturn V and their overall plans. It would be smaller and far less ambitious than their original ideas, scaled down to a bare minimum, but it would be a way to salvage the project. To understand just how far downscaled it would be, we must look at the propulsive force availed by nuclear pulse propulsion. Rocket thrust can be measured in a few ways, and one of them is specific impulse, or ISP. It measures efficiency per unit of fuel consumed by the rocket, and can be indicated in seconds.12 So the Saturn V, while having a thrust of 7.5 million pounds,13 had an ISP of about 263 seconds at sea level. The shuttle, using cryogenic hydrogen and oxygen, was about 450. The atomic reactor rockets described earlier — that heated a liquid fuel with heat from the reactor — were about 900. The atomic-bombs-in-a-combustion-chamber design was about 1,150. But the original designs for Orion ranged from—hold on to your hats—10,000 to one million seconds, or up to 3,800 times that of the Saturn V.
But without the massive thrust from a nuclear-powered launch, and limited to the carrying capacity of the Saturn V (which used relatively low-energy kerosene and liquid oxygen for power), this Orion variant would have to be scaled down to something that could be carried by NASA’s biggest rocket. They returned to the idea of a vehicle of about thirty-three feet diameter (the same as the Saturn V's first and second stages), weighing about 100 tons. The ISP of this design was down—way down—to about 1,800–2,500 seconds, shameful by nuclear pulse standards, but still at least seven times better than the Saturn rocket. In a business where grams matter (and cost a fortune to launch), that's a hell of a deal. While the "Orion Mk. II" was sized to fit on the Saturn V, it could have taken up to four launches to get even this smaller version into space. It was still unclear how many Saturn V rockets would ultimately be manufactured, and they were expensive. But the advantages offered by even a smaller Orion, once in space, would have been vast. NASA was just getting started on the Apollo program, but already had Mars in its sights. Using just a Saturn V–class rocket, or even a number of them, a chemically fueled Mars rocket would take at least five to seven months one way to the red planet. The small Orion would take less than four months. The Saturn V–powered mission could carry a small crew with limited cargo and not much space; small Orion could carry eight crew members and 100 tons of cargo. Even von Braun, who believed in conservative engineering and chemical rockets, became an ardent supporter of Orion (he was, somewhat uncharacteristically for people in a position of technocratic power, usually willing to accept an outside idea if the math checked out). But Orion had no future, and this study would be its last hurrah for decades. In 1963 the US, USSR, and UK signed the Limited Test Ban Treaty. This was designed primarily to slow weapons development and testing on Earth and in the atmosphere, but also applied to the oceans and "outer space." The last bit was the final nail in Orion's coffin. Nuclear explosions in the atmosphere were now even more of a nonstarter. Dyson had since departed the project, and had in fact been instrumental in the treaty (he had nothing against Orion, though he did have second thoughts about the cancer risks). But Taylor and others still believed in its value, and pushed for a few more months. The end came in 1964; the air force was unwilling to continue without help from NASA, and NASA was already stressed to meet the demands of the Apollo program. Orion was cut adrift. It was a premature end to a program that could have returned great results. As Dyson put it, "This is the first time in modern history that a major expansion of human technology has been suppressed for political reasons. "14 While there were legitimate concerns about the use of atomic explosives for launch, and even the carrying of nuclear materials into space for use only outside the Earth's atmosphere, the reasons for the cancellation were primarily political and image-driven. NASA was perceived as a "clean" agency, and the small amounts of nuclear material it did fly was done so with relatively little fanfare.15 US and Soviet military flights carrying nuclear reactors aboard were even quieter. There would have been many other challenges to bring Orion from paper to reality. Supporting a large crew would have required vast life support systems that were not worked out until large submarines— ironically also powered by the atom—began routinely prowling the world’s oceans in the 1960s. Also, as discussed in chapter 3, the intense radiation encountered in interplanetary spaceflight was not well understood until later, and Orion would have required extensive shielding and protective "vaults" for the crew. The list goes on. But with its incredible propulsive power, Orion would have been able to carry the equipment available in the day, without the expensive miniaturization that was required to make the Apollo missions to the moon possible. Large stocks of oxygen, food, and water could have been carried aloft, reducing the need for modern, regenerative life support systems. Radiation shielding could have been designed using traditional materials—the large water supply would be one barrier, and even lead, the traditional solution, might have been used. The crew would have been traveling inside a veritable battleship in space, with all the attendant comforts of home, and the solar system and its mysteries could have, in theory at least, been explored before the end of the twentieth century. The basic engineering was and, according to some who continue to study such spacecraft, is still sound. All that's needed are a few hundred spare nuclear bombs and the nerve to use them. Rod Pyle is a space author, journalist and historian. He has written 10 books on space history, exploration and development that have been published in seven languages. His articles have appeared in Space.com, Live Science, Futurity, Huffington Post and Wired. A number of his books, including "Innovation the NASA Way," "Destination Mars" and "The Space Race" have been adapted for STEM programs as well as university textbooks. His most recent release, "Amazing Stories of the Space Age," has been selected as Book of the Month by the BBC's Sky at Night Magazine. Prior to book authoring, Rod produced nonfiction programming for The History Channel, Discovery Communications and a number of educational program providers, as well as producing TV commercials for over a decade. He also worked on visual effects for "Star Trek: Deep Space Nine" and a number of sci-fi pilots for Paramount Television, and ran the preliminary visual effects unit for the new "Battlestar Galactica." He lives in Pasadena, California.